There is a $900 CORE CHARGE included in price. **** THIS PRODUCT IS NOT LEGAL FOR USE IN THE STATE OF CALIFORNIA **** STAGE 1- Originally these injectors have a flow rate of 60 l/h @ a pressure of 100 bar. Our injector flow rate is 78 l/h @ 100 bar --> 30% increase compared to stock. 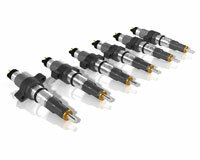 For Model Years 2003-2004 we utilize a 143* spray angle These injectors are capable of up to 700 RWHP. To our reman line: Those injectors are delivered within the same functional tolerances as new BBI injectors and come with the same warranty. There is a core charge on them! All reman injectors are disassembled, cleaned and completely new adjusted. All our reman injectors get a new hard chrome coated valve set and a new DLC coated nozzle. Also all older injectors will be upgraded to the newer better guidance/puck design to have a better more centric connection with less friction between the valve piston and the nozzle needle. Which gets them a better low pressure functionality and will make them more stable over lifetime. All other injector parts are measured, investigated and tested and if necessary they will be exchanged to new parts also. Again our BBI reman injectors come with the same tolerances as new BBI´s, so every part internally has to function perfectly to do so. They are also tested with the same test program as new injectors and you get a test certificate with complete injection mappings. So you can see the function of every injector in over 500 test points per injector. But if money is not an issue we still recommend to buy new injectors as their expected lifetime is always higher as with reman injectors. Nobody can forecast for example how long it will take until an injector body cracks as it is impossible to see/measure/check how much pressure oscillations it has already seen in the past or what kind of pressure it was used at.